A market is in competitive equilibrium if all buyers and sellers are price-takers, and at the prevailing market price, the quantity supplied is equal to the quantity demanded. In this Leibniz, we see how to find the equilibrium price and quantity mathematically, from the market supply and demand curves. Consider a market, like the market for bread described in Unit 8, in which all buyers and sellers are price-takers. Suppose that the market demand function is , and the market supply function is , derived as in Leibniz 8.4.1. The demand curve gives the total amount of a good demanded at each price by the buyers in the market, and the supply curve tell us the total amount sellers are willing to supply at each price. The supply and demand for bread is shown in Figure 8.8 of the text, reproduced below as Figure 1 (remember that we typically draw both with on the vertical axis and on the horizontal—so the graph actually shows the inverse demand and supply functions). Equilibrium in the market for bread. Figure 1 Equilibrium in the market for bread. To find the equilibrium price and quantity, we need to solve a pair of simultaneous equations—the demand curve and the supply curve—for and . In standard cases like the one shown in Figure 1, where is an increasing function and a decreasing one, there is at most one equilibrium price. Having found the equilibrium price by solving this equation, the equilibrium quantity may be found by substituting the equilibrium price back into the supply or demand equation. 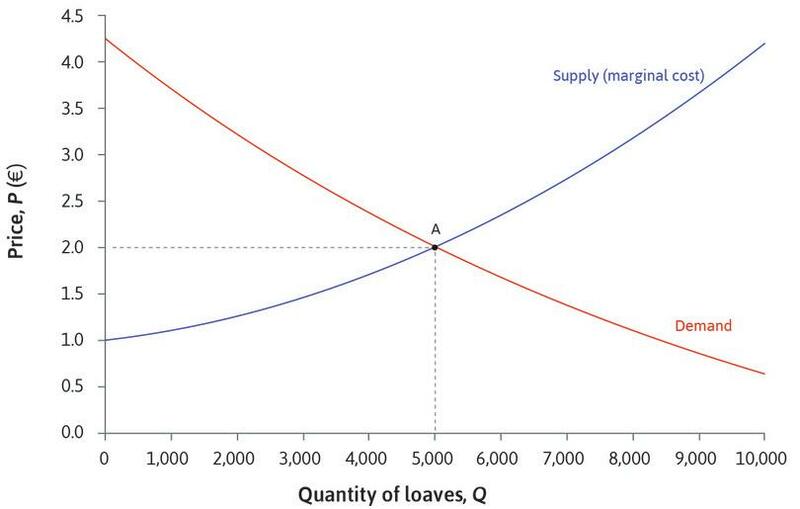 In Figure 1 the equilibrium price is €2, and the corresponding quantity is 5,000 loaves. is positive if and only if . If this condition does not hold, then there is no market equilibrium in which a positive quantity of the good is traded. Read more: Section 1.2 of Malcolm Pemberton and Nicholas Rau. 2015. Mathematics for economists: An introductory textbook, 4th ed. Manchester: Manchester University Press.